Free Syrian Army: This group was created by the Syrian Muslim Brotherhood in March of 2011 via funding from the Egyptian Muslim Brotherhood. The Free Syrian Army consisted primarily of Syrian Muslim Brotherhood at its creation, but currently, most members are foreign Islamist mercenary fighters called upon by Muslim Brotherhood and al-Qaeda. The Free Syrian Army has participated with ISIS at times, al-Qaeda at other times, and more recently has been fighting alongside Jaish al-Fateh (the largest coalition of Islamist groups). In 2011, the Free Syrian Army started out with two primary brigades: the Farouq and the Khalid ibn Walid brigades. The Khalid ibn Walid brigade was funded and armed by the Egyptian Muslim Brotherhood and consisted mostly of foreign Islamist mercenary fighters. The Farouq brigade consisted of Salafists (Wahhabists), who were armed and funded by Saudi Arabia and were affiliates of al-Qaeda. Starting in 2011, the Free Syrian Army’s Farouq brigade worked in tandem with al-Qaeda in Syria, most specifically when attacking Christian villages in Syria. The Free Syrian Army’s Farouq brigade is extremely knowledgeable regarding media and social networking. The group has experts who produce videos for the television networks of Qatar (al-Jazeera) and Saudi Arabia (al-Arabiya). The propaganda videos they produced are often used by Western media. Jabhat al-Nusra: This is al-Qaeda's main affiliate in Syria. Jabhat al-Nusra means “victory front”. Jabhat al-Nusra, or al-Nusra, stands for the Islamic Army’s front line of fighters for Islam, and of victory for Islamic takeover. Al-Nusra has been a long time supporter of various “opposition” groups including Jaish al-Islam, Ahrar al-Sham, and the Free Syrian Army. They control enormous territory in Syria. Jund al-Aqsa: Jund al-Aqsa is an al-Qaeda affiliate. Jund means soldiers and Aqsa is the mosque in Jerusalem. To Muslims, when Islam takes Jerusalem and al-Aqsa, it means Islam will then conquer the world. Harakat Ahrar al-Sham (the movement to Free Sham, or freeing Sham to Islam). Sham is Syria, Lebanon, Jordan and Iraq. Several Islamic terror groups have united under this group to fight for Sham—to make the entire region an Islamic Law region. At present, this group primarily consists of a-Qaeda fighters. Jaish al-Islam: The Islamic Army. This is a large Islamic army who fights alongside other Islamic groups in an attempt to take more territory for Islam. This group of foreign Islamists is backed by Saudi Arabia and consists primarily of al-Qaeda groups. Jaish al-Fateh: In 2012, Turkey’s President Erdogan and Saudi Arabian prince Mohammad bin Salman joined forces in backing Islamist groups who are trying to overthrow the current Syrian government in order to form a Sunni Islamic State. Then, in 2015, Saudi Arabia and Turkey created a coalition army of foreign mercenary fighters with several divisions so it could spread itself throughout Syria. This army was named Jaish al-Fateh. Both Turkey and Saudi Arabia fund and arm Jaish al-Fateh. Turkey allows the foreign fighters to enter Syria via the Turkish border. Jaish al-Fateh means army of the opening, as in opening for Islam. Photo: Terrorist acts committed by various "opposition" groups occur daily throughout Syria, primarily in the larger cities, such as Aleppo, Damascus and Homs. 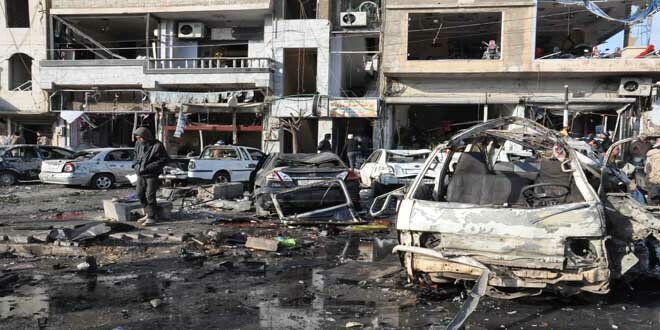 Photo is of a recent terror bombing in Homs.